**Please note: This DVD is in PAL format and can generally only be played on a computer. On behalf of horses everywhere, Sam and Sascha have compiled some highlights of their own harmony with horses. 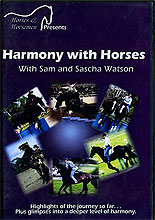 These highlights have been accumulated during the first eight years of Sam and Sascha's connection with horses. Their aim is to allow the horses to present themselves as the beautiful creatures they are, encouraging our curiosity in order for us to better understand them and to care for them in a manner that fulfils the horse. Please enjoy and note that, when they started, neither Sam nor Sascha knew one end of a horse from the other.